For registration pls put Your username for omnius server. Omnius Server - licence Full for Samsung and SE allows you to fast, simply and effectively service your Sony Ericsson and Samsung mobile phone without any device as box or USB key on 1 computer. All you need to have it's USB cable. Instantly offers you many great features as unlock, flash, GDFS reapir etc. 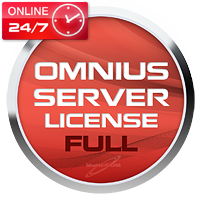 Omnius Server 12 months - Android unlimited + Full it's new promotion from Omnius Server that gives Android unlock unlimited to all 12 months Full account. By now purchasign access fro 12 months you will be able to unlock unlimited all Android phones upported by Omnius server. All you need to have it's USB cable. Instantly offers you many great features backup, unlock..... Simply and effectively service of any SE.